The GIG at Belmont University in Nashville, Tenn. August 8, 2017. 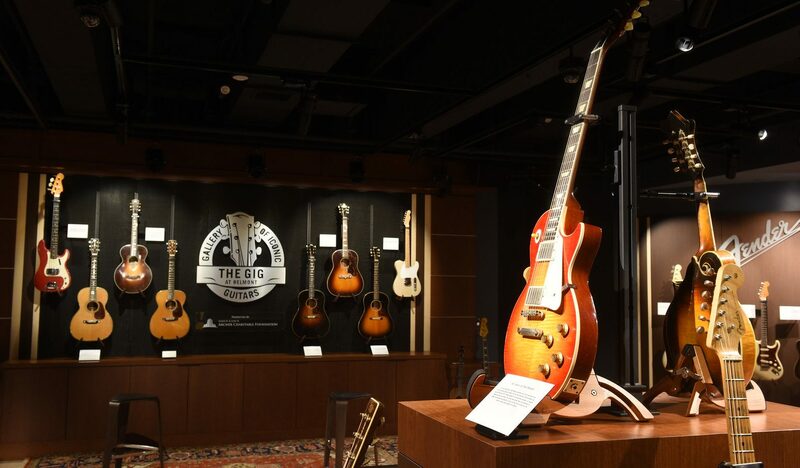 It’s quite a month for guitar aficionados as April marks the celebration of International Guitar Month as well as the one-year anniversary of the opening of The Gallery of Iconic Guitars at Belmont, also known as The GIG. International Guitar Month, which began in 1987, is an annual celebration of guitars and guitar products promoted by the Guitar and Accessories Marketing Association (GAMA) and the National Association of Music Merchants (NAMM) to attract awareness and develop loyalty. It’s the perfect timing for The GIG, which opened its doors on April 25, 2017 and attracts tourists and musicians alike who seek a sneak peek at historically significant stringed instruments. The GIG is the result of a gift to Belmont University of nearly 500 vintage guitars and supporting endowment—amounting to a total value of approximately $10.5 million—from the estate of the late Steven Kern Shaw. Shaw was a collector, philanthropist and the grandson of Jerome Kern who was one of America’s foremost composers of musical theater and popular music (responsible for such classic songs as “Ol’ Man River,” “The Way You Look Tonight” and “Smoke Gets in Your Eyes”). Steven Kern Shaw family friend George Gruhn (founder of Gruhn Guitars and vintage instrument expert) serves as co-executor of the estate and noted that Mr. Shaw’s will specified his desire that the instruments be donated to an institution capable of properly exhibiting and caring for them, preferably in the Nashville area. The Gallery of Iconic Guitars is open to the public Monday through Saturday from 9 a.m.-5 p.m. and Sunday from 1-5 p.m. Admission is $5, and free for children under 12 as well as Belmont students, faculty and staff. Visit thegigatbelmont.com for more information and to purchase tickets.